I am so pleased with the new Titan XD Platinum Reserve Diesel I just bought. I was considering the Ford Limited, but when I got a chance to see this beauty there was NO CONTEST! It is loaded with all the bells & whistles you could ever want. You would think you were driving a top of the line BMW or a LEXUS. It has all the luxury of a full size Range Rover HSE - but with way more room in the front and back seats, and it has massive pulling power because its got that wild crazy V8 Cummins Diesel with 555 ft pounds of torque. For the price, there is nothing that touches this. Heck, theres nothing at any price that touches this as far as I am concerned...I love it! The other thing I have to say is that Rick Proctor is an amazing sales person because he is totally NOT the sales stereotype - but rather he listens, and he cares, and he follows up. You cant fake that. I took a long time to make my decision, but Rick never pushed me. Instead, he provided enormous value and help. Hes outstanding the way he does business. I also want to heap praise on Danielle who is the business manager. Shes very good at what she does + very helpful in getting me to understand all my different extended warranty options (I ended up buying an extra 7 years / 160,000 km bumper to bumper). Finally, I was blown away by Sean Turner the owner. Youd never know that he was the big cheese there. Thats because hes humble, helpful and he really seems to have a ton of fun. I suppose thats the big thing that impressed me: how everybody was so helpful & polite and seemed to be a big family. This is one company that knows how to treat customers. Thanks you guys! 10 years ago I purchased a Nissan from this company and to this day they will not leave me alone. I havent had one for years and will never own another Nissan because of River City. I continue to get their junk mail and all requests I have made to stop have been ignored. Their so called "Service" is a joke. They care nothing about their customers and their lack of respect is the reason I sold my Nissan. The original purchase was a total run around and they kept me waiting for hours. At the time I was recovering from a broken back and neck and had asked they have everything ready when I arrived so I could leave as soon as possible. When I got there, NOTHING was ready and the person I had dealt with, wasnt even there. 3 hours it took to get me on the road and they havent left me alone since. Fantastic service - passing through on our way to Vancouver from Calgary & the tire pressure light was lit. The pressure senders had not been reset by the Calgary dealer when we changed the winter tires for the summer tires. River City service staff was fantastic and reset the sensors even though it required a non-standard tool and took almost an hour. This great service and they refused to charge us for their help. If we lived in the area River City Nissan would be our dealer. Five stars for a great group of people. 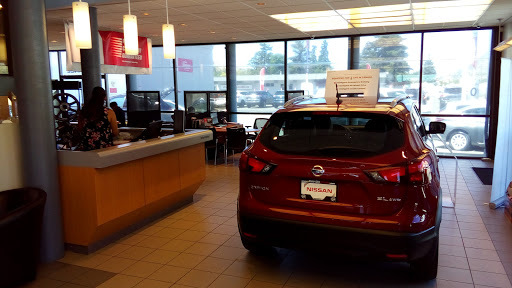 Awful service, unfortunately got problem with my Nissan Altima transmission, then I asked for the service in River City Nissan, they did all transmission inspection and stated that it broke down (what is common problem for this CVT transmission) and my car needs a new transmission. Then, they unfairly declined the warranty service without any explanations. I am totally unsatisfied with their work, never recommend to visit it. Bought a car from them, and the salesman treated me great but after I went back the same day with the tire pressure light on because the free winter wheels/tires didnt come with sensors which I was never told about, the mgmt.. treated me terrible. The upper mgmt. was rude and seem to care only about the money and not about the customer. The success of this business will Eco in its customer service. I bought a new Nissan Micra and am very pleased with the car. Brandon, the salesman I dealt with was up front, honest and did not apply any high pressure sales tactics which I appreciated very much. Everyone involved with the purchase was friendly, informative and professional. I would recommend this dealership to anyone interested in purchasing a vehicle. Great personalized service from a dedicated staff. Owner and Sales Manager provide direct service. Prices are fair. Discounts are passed on to the customer. The Nissan brand is clearly superior. This will be our familys sixth vehicle from River City Nissan and we couldnt be happier! Such a great Environment they make you really feel like family! The sales process is seamless and everyone was so friendly. If you are looking to buy without all the pressures of most dealerships I would recommend River City Nissan. Had a great experience buying our truck here. Jim was an excellent salesperson to work with, left us alone to look and talk about vehicles and let us strap our carseats in any vehicle. Highly recommend. I absolutely loved the sales staff here! Extremely professional and accommodating! I couldnt have had a better car buying experience! Will recommend this place to everyone I know! Bought my second Nissan from River City Nissan. The guys and gals there who helped me through the process are fantastic!!! Thank you guys so much! Im lovin my new Altima! !